Solar Man was one of the earliest superheroes to debut back around the Second World War where he was quick to defend the entire planet. 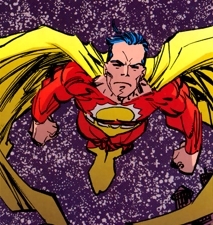 As an increasingly large amount of super-powered defenders emerged on the scene, Solar Man began to look weak in comparison. As his peers mysteriously vanished one-by-one, Solar Man bizarrely started to increase in power. As the years passed by, the increasingly more powerful Solar Man soon became one of the most famous and beloved superheroes. His defending of Earth continued on through until the seventies where Solar Man started to become disillusioned with the world’s governments. His frequent ally and best friend, Sgt. Marvel, was selected as his partner in installing a new crime free regime. Jealous at the growing relationship between Sgt. Marvel and Tiger, and the influence that Tiger had over her lover, Solar Man sought to resolve the situation. He murdered the heroine before approaching Sgt. Marvel with a proposal of them conquering Earth whilst ridding the planet of all crime, by employing a ruthless zero tolerance attitude to any and all criminals. With little chance of defeating his insane friend in combat, Sgt. Marvel was forced to employ the God Gun. He wished Solar Man out of existence, firing the weapon and erasing the hero from reality in an instant. Tiger was then resurrected with the second of three wishes for Sgt. Marvel and allowed the couple to pursue a relationship and partnership that lasted for decades to come. In 2006, the God Gun had fallen into the hands of Mister Glum after the death of Sgt. Marvel and the alien dictator had used the weapon to enslave all of humanity. Dragon spent a year trying to depose this cruel world leader and eventually succeeded when he destroyed the God Gun. This act reversed all of the wishes made previously which not only liberated humanity, but also caused Tiger’s death to be restored whilst Solar Man returned to existence. Solar Man instantly sought to continue his mission to rule Earth with a merciless anti-crime regime but his incredible senses made him aware of the damage done to the planet by Mister Glum. Solar Man set about repairing the immense devastation and saving those endangered, only ignoring this mission to deal with super-powered menaces. The first instance of Solar Man’s intervention occurred when Universo was making his second attempt to consume the planet. He flew into action and whereas the other heroes present could barely gain Universo’s attention, Solar Man effortlessly overwhelmed the Devourer of Worlds. Solar Man killed the cosmic entity before executing his herald, Mother Mayhem. Solar Man returned to saving the planet but his war on crime continued when he eliminated a rampaging Bludgeon. He then saved Rapture from sexual assault at the hands of Johnny Nitro but then executed her too for a murder she committed years ago. Goofus & Gallant were the next to fall before the Uglies Unlimited that abducted She-Dragon were incinerated. It was not until Solar Man executed BrainiApe with his heat vision in front of Dragon that the two heroes nearly came to blows. Solar Man’s merciless handling of villains infuriates the law-admiring Dragon and he decided that this slaughter cannot continue. Dragon started to work alongside Rex Dexter to find a weakness of Solar Man before setting out to bring down the mass-murdering hero. Dragon and Rex Dexter managed to recruit assistance in the form of Invincible, Spawn, Witchblade and ShadowHawk II. They broke into Solar Man’s headquarters of the Citadel of Seclusion where they disabled his robot guards before locating a sphere. This stasis chamber was opened up by Rex Dexter which released numerous Golden Age heroes that had previously gone missing. They had long-served as an unwilling power source to Solar Man. With their liberation, Solar Man was left weakened and vulnerable and when Dragon attacked him, his punch accidentally caused his foe’s head to be smashed in half.